Stanza touchscreen artwork editions. 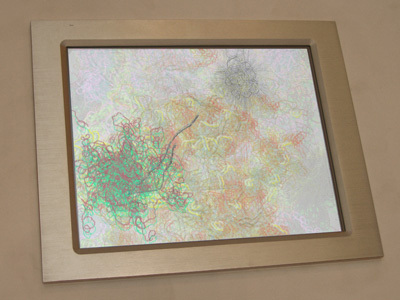 Digital generative and interactive artworks for sale . Interactive + generative systems. 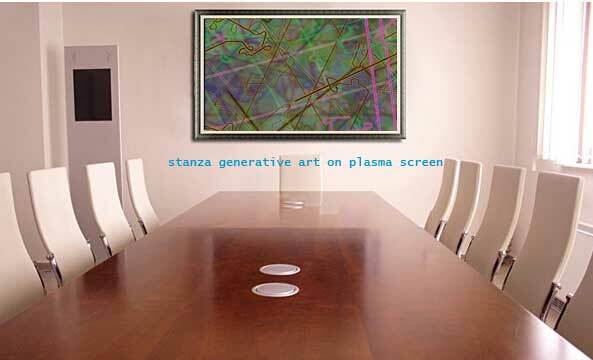 Stanza authored several artworks and these are available as touchscreen editions. Each edition of ten contains a suite of artworks from the project of the same name. 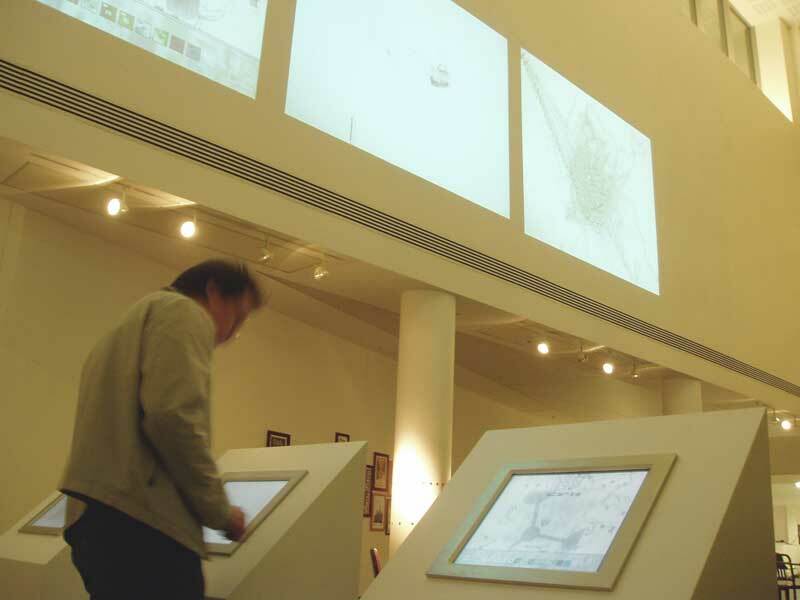 The touchscreen units are custom built and configured to load works automatically (viz. plug-n-play). For installation, they can be hung on the wall like a painting or they can mount with screens flush to the wall, or other surfaces. They have been made as editions so collectors may purchase the work and galleries may exhibit more easily. 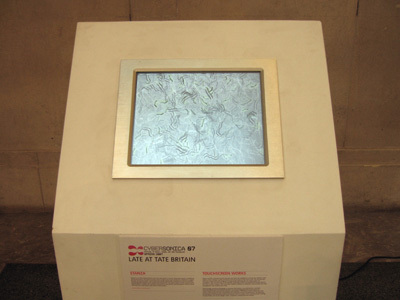 The illustration computer below shows the first silver prototype, they are silver steel framed (see image below) and are also available in a mounted wooden framed box or set square to the wall. 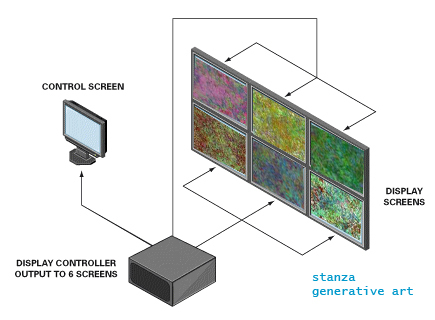 Stanza uses computers to develop expressive possibilities between himself and his audience. And, underlying these simple interfaces and engaging forms are sophisticated formal and technical structures, including software agents, custom hardware and complex networking. His self-generating artworks contain the essential pleasure of digital playfulness, while also approaching deeper issues about people and information networks. 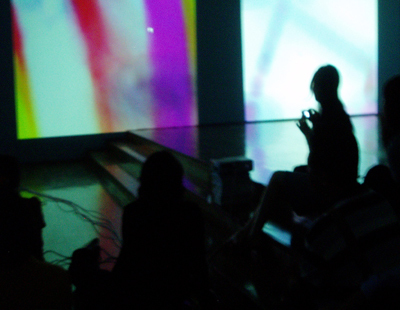 This singular process of participation and inquiry can be scaled to large networks or to individual users, and it can also support live performances and large-scale installations. Stanza's interactive digital artworks from the past decade relate to wide ranging technical and cultural concerns. Since 1994, he has produced numerous bodies of work, each of which is described briefly below: these are also now made exclusively for this touchscreen machine and available in very limited editions. There is a suite of works within each edition. You can find the works by moving your fingers down to the bottom of the screen. The previously hidden menu then appears. You can then select a new work by touching the screen. Within each work there are several layers of interactivity. Some works have hidden areas, in some the interactivity is more clear, and in others one has to explore to find and experience different parts of the artwork. And in other works such as Biocity there are generative areas, ie, if left alone the artworks will generate on their own over time. 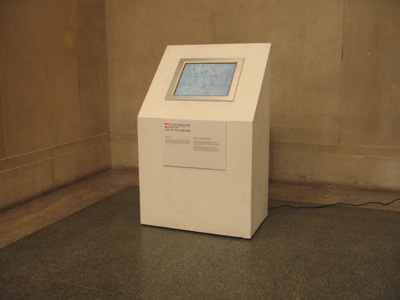 Images from Late at Tate Britain event: 2007 (Shows touch screen artwork in a plynth) Stanza Images from exhibition at Venice Biennale 2007. 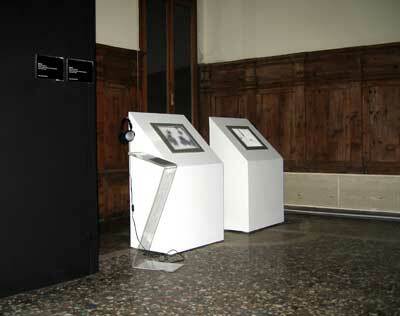 Shown at New Forest Pavilion, 52nd international Art Exhibition - la Biennale di Venezia. 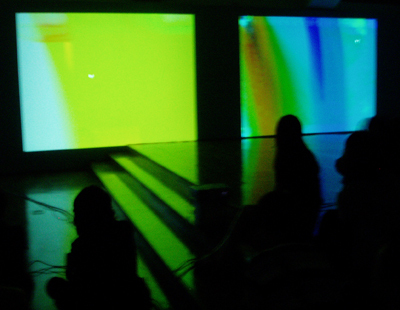 Venice Biennale 2007. Inner City and Biocity 52nd international Art Exhibition Thanks to Helen Sloan and Scan. Tate Britain. (Part of Late at Tate Britain series, by Cybsersonica) Thanks to Lewis Sykes 2007. 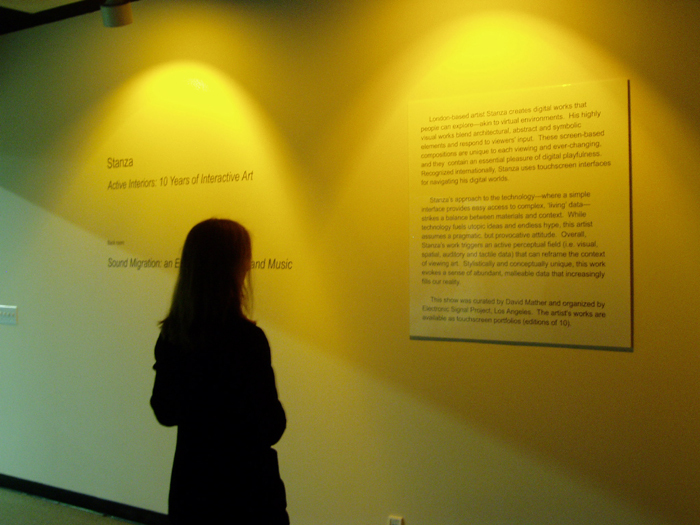 Active Interiors: 10 Years of Stanza's Interactive Art E.S.P. Media Lounge, Pacific Design Center, West Hollywood USA. 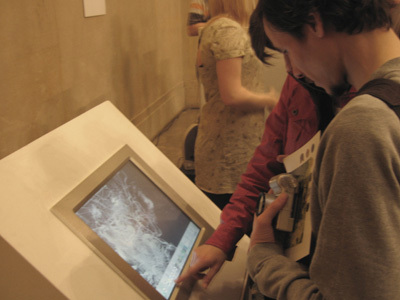 The first showing and sales of the touchscreen editions where supported, curated and exhibited by David Mather in 2004 in LA. Sales. These are limited edition artworks. They are all individually numbered in each edition. For provenance, the sold copies have an individual number of the edition in the bottom of the main opening screen. This is a unique number. This number also matches the number and title on the signed cd rom. This work cannot be copied as it is the only one with a unique number and the same number on signed disk. A number of demo copies are available for viewing only. A series of generated paintings, whose forms are dictated by mathmatical behaviours. The vast range of colors and shapes is visually exciting triggered by touch and movement on the screen . The variations are a series of generated paintings, whose forms are dictated by mathmatical behaviours. 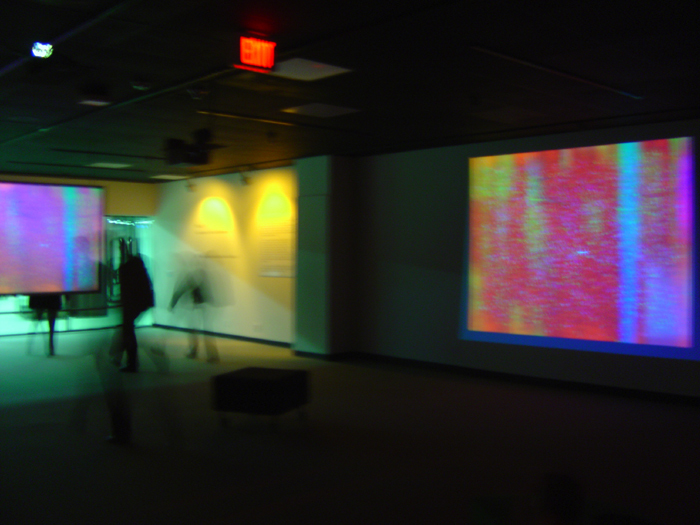 The vast range of colors and shapes is visually exciting triggered by touch and movement on the screen 2006. Data grows and evolves in this complex project of visual elements and sounds that pulse with intriguing behaviors like networks of living information based on city structures. 2003..
Maps, buildings and geographic symbols meld into patterns of dense urban space. This journey invites exploration and discovery amid varying degrees of order and chaos. 2001. This self-referential explosion of data uses computer icons, scripts and codes that grow exponentially to create intense desktop feedback. The following text is by Charlotte Frost for the Artsway catalogue to accompany work to the Venice Biennial. 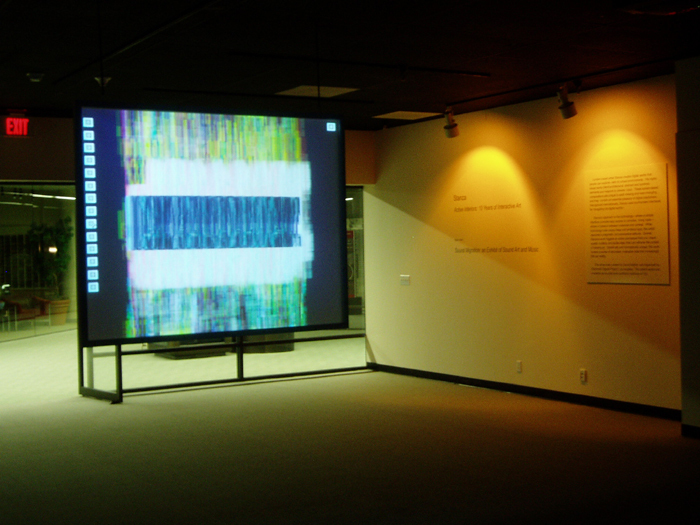 Biocities (2003) and Inner City (2002) are audio-visual, interactive, digital paintings. They form part of Stanza’s Amorphoscapes series (which he has been working on since 1997). Unlike existing web-based incarnations, these are limited-edition touch-screens which better demonstrate Stanza’s uncompromising ability to craft technology. These works are exquisitely executed. Aesthetically and technologically they are flawless, standing out vividly against a backdrop of new media art which can be clunky and ill-defined. Even to the untrained eye, or those uninitiated in new media arts, Stanza’s skills and outputs as an artist working with electronic technologies are apparent. These works present two predominant devices to actively trace urban topographies. One is a seeping aesthetic, where blank screens are gradually flooded with colour and texture which appears to perpetually map and re-map its terrain (as seen in Biocities); it is American-Action-Painting-meets-London-Underground-cartography as the city is given life through visual veins and audio arteries. The other is a stamping aesthetic where heavily-stylised city corners, crevices and conversational off-cuts are sporadically overlaid causing a constant collaging (as in Inner City). Harder to characterise, this effect is something like a strobe inflicting O’Keefe’s eye for detail on a minimalist canvas. Such effects are heavily indebted to Modernism but no less impressive in their new media incarnation. For me, what is most striking about these pieces – and indeed Stanza’s present work The Emergent City – is its reference to ritual, or socially-loaded, repetitive behaviour. The rituals I find implicit in these works are both urban and artistic. Each of the works amasses aural and aesthetic details which loosely depict a range of city-specific behaviour. However, and this is key, Stanza does not tell us what these behaviours are. He provides a montage of animate archaeological evidence which evoke the comings-and-goings of a city and its inhabitants. The effect is somewhat like sitting at a central hub of city activity and watching the constant ebb and flow of people, trains or traffic, feeling both integral and irrelevant as the movement occurs both because, but also in spite of your presence. They also refer to the type of behaviours encoded in the ritual of art gallery attendance. They demand that the audience co-author not just their meaning, but also their audio-visual output, which requires a different level of interactivity on the part of the audience. This is art about active not just intellectual engagement. This is art which does not exist without a willing participant. Yet having asked the audience to behave differently, Stanza immediately puts them at ease by offering these works as editioned objects which might well sit alongside paintings and perhaps discuss the aesthetic common-ground of paint and pixel. It seems Stanza intends to build a new relationship between artwork and audience, but not by reconstructing the physical architecture of art history which he leaves very much intact. The art historian Dana Arnold claims that the architecture and associated activity of the art gallery generate “the cultural life of a society”. With these works Stanza provokes the participants in the ‘cultural life of society’ to reconstruct a range of naturalised urban behaviours whilst rebuilding not just a few of their ideas about art production and presentation. 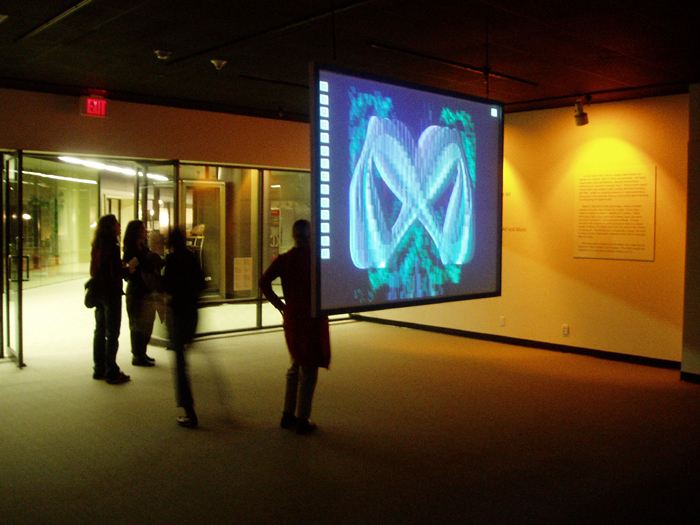 Stanza performance using three interactive touch screens and projected images. Arts Depot North London. 2005. Images shows screens mounted into plynth. They can also be wall mounted, or fixed ino the wall. Amorphoscapes: photo below taken in Korea at Samsung Media Centre. 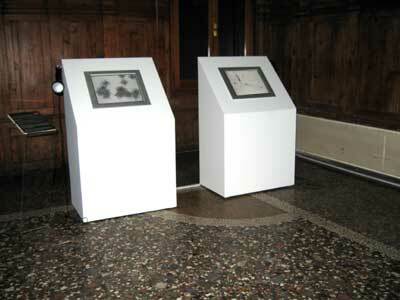 Touch screens works with projection onto wall. Sizes variable. 2004.